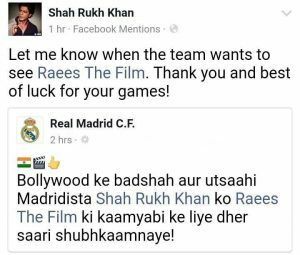 Real Madrid Wishes Shah Rukh Khan All The Best For Raees!  SRK and Real Madrid displayed online bromance. While SRK sported the Real Madrid jersey, the team wished SRK all the best for Raees. It all began when Shah Rukh Khan was presented with an honorary Real Madrid C.F. jersey and this was shared on the club’s Facebook page. After giving SRK a jersey emblazoned with the number 555, Real Madrid has once again interacted with the actor on Facebook, this time for his recent release Raees. In a post on Facebook, they wished that the actor’s recently released movie, ‘Raees’ turns out to be a super hit. SRK, as we all know, is a sports aficionado and has stakes in several cricket teams and with football slowly gaining momentum in the country, Real Madrid’s association with Shah Rukh Khan is sure to increase their popularity among all the Indian football viewers. Screams Hala Madrid with SRK-esque open arms.